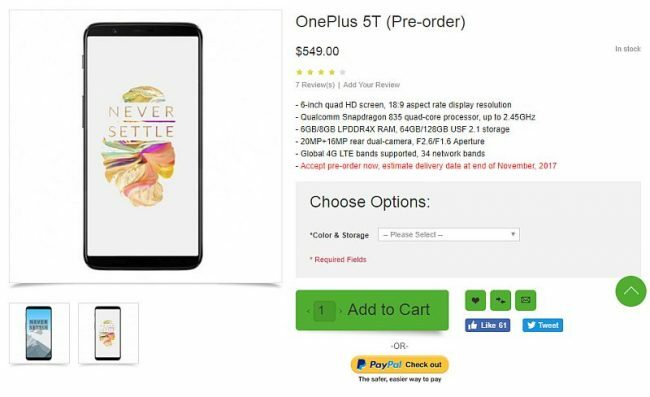 OnePlus 5T price and specifications have leaked online courtesy a listing on third-party Chinese e-commerce retailer Oppomart. As per the listing, OnePlus 5T price is $549 (roughly Rs. 35,500) and is up for pre-order, with deliveries most likely by the end of November. This comes the same day as the OnePlus 5T specifications leak via an Antutu screenshot that shows much of the hardware as well as Android Oreo out-of-the-box. It is widely expected that the smartphone will be unveiled sometime in November, though the company has, predictably, been mum about the possibility of its existence. These specifications all match with OnePlus 5’s, though differences include a larger 3450mAh battery, larger 6-inch display, and a full-HD+ resolution of 1080×2160 pixels. It is also thicker than the OnePlus 5, weighing in at 164 grams. The thickness is said to be identical at 7.25mm, but the phone will be slightly wider and taller at 157×75.4mm. The handset is rumoured to support global 4G LTE bands and support 34 network bands. The alleged OnePlus 5T recently made an appearance at the AnTuTu benchmark suggesting the OnePlus A5010 model name, and listing similar specifications apart from a 20-megapixel front camera, and a boost of the rear camera. Some of the other rumours surrounding the OnePlus 5T include an aluminium frame with a bottom-positioned speaker and a slightly higher capacity battery than the 3300mAh pack available on the OnePlus 5. It is expected to move the fingerprint sensor to the rear panel, in line with the adoption of a bezel-less display.